My dream higher ed marketing position would allow me to tell chancellors everywhere: Branding doesn’t solve your problems. Funding the educational mission, though, might. That means investing in faculty, in research, in students. Offer reasonable sabbaticals. Offer ample financial aid. Increase tenure track lines and reduce adjuncts back to where they belong: professionals with a stable living outside of academia teaching professional track courses. The sorts of organizational investments that make a degree accessible and valuable. The sorts of organizational investments that don’t seem to be happening, much, in colleges. Which seem instead t0 put their money into the apparatus around education. Fancy dorms and rec centers, marketing, administrators. But if you’re having trouble marketing your product, MAKE A BETTER PRODUCT. Instead of investing a ton of dough in marketing campaigns, try investing that dough in the educational mission. Then, within reason, invest in a marketing infrastructure that sells your campus’s achievements to the donors you need. Since public funding of higher ed is like Atlantis. But don’t think the new logo is going to make the degree more meaningful when you’ve stripped away so much of the resources that faculty and students need to actually teach and learn something useful at college. The new UC logo doesn’t look smart. It looks like outdated tech culture. It has nothing to do with the product it represents: an engine of democracy through high-quality public education. A landmark tiered system of higher education that spreads opportunity around, instead of hoarding it among the already wealthy. The petally U and fading C doesn’t say anything about that, unless you think of the top of the U as an open book? Maybe? But then I read this corporate branding insider’s take on the mishugas and moderated a bit. The logo is meant to be flexible, manipulable, adaptable. 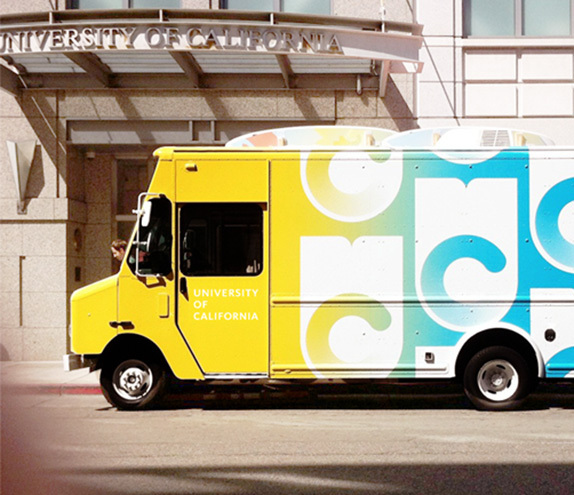 Does the whole UC system needs its own brand? And it’s meant to create a system-wide brand identity to facilitate funding and such. To establish a “UC” brand, separate from the individual campuses. To market the system as something work public investment, which I can agree with. To package the UC system as another consumer good to delight us. OK? Cool? I guess? But wouldn’t it be better to spend the money on making a UC degree worth our investment? I obviously have some ideological difficulty with turning a UC degree into a consumer good. This attitude made teaching increasingly difficult for me. Students-as-consumers aren’t likely to believe that learning happens only after protracted intellectual wrestling. They aren’t likely to pay attention to lectures that don’t offer spoonfuls of sugar to make the medicine go down. They are more likely to think that a UC degree is like a candy bar they can unwrap and eat. That they deserve to unwrap and eat. That teachers are there to feed them, and then give them As for showing up. On the other hand, this is the world we’re in. If we want public investment in the UC system, maybe we have to play like we’re selling this candy bar. And maybe a meaningless image that can be iterated endlessly on coffee mugs, pens, and t-shirts is our path to reclaiming the legacy of robust public higher ed. Yeah, it’s definitely better to put funding into the actual product–education–than into consultants and advertisers. As for the new logo, meh. It’s too simple and ambiguous with the subtle U and the disappearing C. Why is the C vanishing? That looks odd. Some UC profs speculate in comments at this post. My favorite is (my old professor) Chris Newfield’s guess that it’s an unconscious representation of the administration’s sense of failure, or the built-in inequities of the system. Over 50K supporters petitioning the system to withdraw it. And an excellent toilet version. The toilet version is funny! These oversimplified logos seem to be the trend. It’s the same with icons–Gmail’s icons are so simple they are now meaningless. That’s interesting! I’ve since seen commentary about the new UC logo being essentially MOOC-ready: anticipating a time when a university presence will be more significant online than off. I can’t help but think of my academic training in semiotics: the emptiness of this signifier, the new logo, helps it connect more emotionally to consumers. It’s all so corporate, which is perhaps a new reality that us old-school liberal arts types have to just accept.